These instructions are for registering an application in Azure AD so that my lateral movement reporting script can use the Graph API to access Azure AD audit logs and the list of applications granted access via user-based consent. Go to the Azure AD admin center. Enter a name (which can be anything), such as Lateral Movement Script. At the bottom, click Register. In the application’s Overview pane, copy the application’s ID by hovering just to the right of the GUID and click on the copy icon that appears. Paste the GUID into the script as the value for the $appId variable. 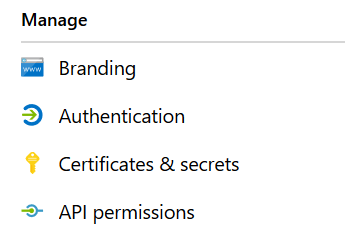 Back in the applications’ navigation pane, under Manage, click API permissions. Under Commonly used Microsoft APIs, click Microsoft Graph. For the type of permission to add, click Application permissions. At the bottom, click Add permissions. Because the application (script) won’t be logging in as a user, in the list of permissions you can optionally choose to click User.Read, then Remove permission, then Yes, remove. The two permissions that you added require admin consent, so under Grant consent, click Grant admin consent for [Company], then Yes. In the navigation pane, under Manage, click Certificates & secrets. Under Client secrets, click +New client secret. Under Expires, you can leave the expiration as the default 1 year, or you may choose to set it one of the other choices. (Regardless of the expiration, you can always delete the secret at any time.) Then click Add. An activity that provides an attacker access to resources after detection of an account compromise is called persistence. One example of this is automatic forwarding of email. Using leaked credentials, the attacker logs into a mailbox and configures mail to forward (usually to an external address). Even after the account’s password is reset, the forwarding setting remains in effect. 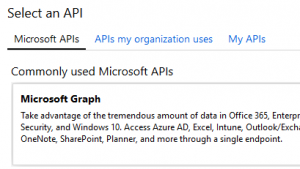 Leveraging the Graph API requires that you register an application in Azure AD. This is because you have to specify what permissions (access) you want the application to have, as well as how the application will authenticate. (There are multiple ways to authenticate, but I am using a client secret.) I have created a separate post with those instructions. Some admins may not want or have the ability to register an application, so it is not required, but the output will obviously not include the application consent information and Office 365 Group member additions. For those that do, you will need to edit the script and set $useGraphApi to $true , and provide the values for the $appId , $clientSecret , and $tenantDomain variables. The script requires you to be connected to Exchange Online and have the Azure AD module installed and connected. It will search, by default, for activities in the last seven days, but you can specify a start and/or end dates. Bear in mind that the unified audit log retains entries for 90 days for non-E5 users (and one year for E5-licensed users or those assigned an Advanced Compliance add-on license). Additionally, Azure AD audit and sign-in log entries are retained for 30 days for P1/P2-licensed users (seven days for Free and Basic users) (source). Handling the output is something I spent a fair amount of time working through. This is because of how PowerShell processes multiple objects in a script that contain different properties. (It assumes the properties of the first object in the output apply to all successive objects, so those successive objects will only show properties that are also in the first object.) I experimented with key/value pairs in generic properties, but it is ugly and requires much more work from you if you want to parse the values for further processing. You can download the script or copy below. Beginning of search window in audit logs. Defaults to seven days (and current time) ago. End of search window in audit logs. Defaults to current date/time. Switch to have the output objects sent to the pipeline instead of the screen. Whether a check that does not return any items should say so in the screen output. $dateFilter = " and activityDateTime gt $formattedStart and activityDateTime lt $formattedEnd"
$consentsGraphFilter = "?`$filter=PrincipalId eq `'$($aadUser.ObjectId)`'"
$signInGraphFilter = "&`$filter=appId eq `'$($consentedApp.appId)`'"
Owner auditing includes UpdateFolderPermissions: $mailboxOwnerAudit; User audit bypass enabled: $mailboxAuditBypass"
$calendarPublishing = Get-MailboxCalendarFolder -Identity "$($UserPrincipalName):\$($primaryCalendarPath.Substring(1))"
$groupMemberAddGraphFilter = "?`$filter=activityDisplayName eq `'Add member to group`' and initiatedBy/user/userPrincipalName eq `'$UserPrincipalName`'"
The default for the script is to get all appointment items for the next year. This includes all occurrences of recurring appointments. For the really busy person, or if you specify the end date beyond a year, that could mean more than the maximum of 1000 items. To accommodate more than the search result maximum, you would normally use paging. A calendar view, however, does not support paging (even though the search result has a property to indicate there are more items than what were returned). To work around this I added pseudo-paging that performs successive loops with a start date that is set to the start of the last appointment in the previous search result. This causes duplicate items in the collection of appointments, though, so I added a step to filter these. These changes are transparent, so you don’t need to do anything to accommodate mailboxes that have more than 1000 appointments. Another change is the addition of the AttendeeMeetingsOnly parameter. This switch causes the script to only process meetings where the mailbox is an attendee. Parameter sets have been defined so you cannot use this parameter at the same time as IncludeAttendeeMeetings. This now means the options are to process meetings where the mailbox is the organizer (the default), to additionally process meetings where the mailbox is an attendee (use IncludeAttendeeMeetings), or to process only the latter (use AttendeeMeetingsOnly). I changed the way the script identifies recurring meetings because of an issue that sometimes occurs, causing the IsRecurring property to incorrectly have a value of True on a single-instance meeting. And, lastly, already canceled meetings are now excluded. (An attendee mailbox that has received a meeting cancellation, but has not been “accepted” by the user, is already in a cancelled state in the mailbox and cannot be declined.) Thank you to Zafer for identifying bugs recently so they can be fixed. To avoid naming conflicts, my cmdlets are Get-MailboxRecoverableItems and Restore-MailboxRecoverableItems . The EXO cmdlets use native access to the store and require you to have the Mailbox Import Export role assigned to use them. My module uses EWS and requires either full access or the impersonation right. (Include the UseImpersonation parameter when you want to use the latter.) If using on-premises, you can omit the Credential parameter to use your current credentials. If using Exchange Online (or to use explicit credentials on-premises) you need to use the Credential parameter to provide a credential object. SourceFolder is where the item is currently located. LastParentPath is where the item will be put if you restore it. (This is why I mentioned I am replicating the behavior of the native cmdlets, because I wouldn’t have named the property that.) This path will be the original folder if the LastParentFolderId is populated and that folder still exists, as indicated by the value of OriginalFolderExists. Otherwise, it will be the path to the default folder of the item’s class. Because of a bug in EWS when translating folder entry IDs in the archive mailbox, items restored from the archive mailbox will always be put in the primary mailbox’s default folder for the item’s class. OriginalFolderExists will never have a value for items in the archive mailbox because the translation bug makes it impossible to determine if the original folder still exists. You can’t pipe the output of Get-MailboxRecoverableItems to Restore-RecoverableItems (nor can you do so with the native cmdlets). The Restore cmdlet takes the same arguments as the Get cmdlet. You can modify the search filter for the restore based on the output of Get-MailboxRecoverableItems , including specifying an item entry ID or folder entry ID, but the Get cmdlet is essentially the same as running the Restore cmdlet with the WhatIf parameter. The default is to search just the Deletions folder of Recoverable Items (named, confusingly, RecoverableItems), but you can optionally specify any or all of the Purges folder, the archive mailbox’s Deletions folder, and the archive mailbox’s Purges folder. (The cmdlet will silently skip the request to search an archive mailbox if there isn’t one, allowing you to pipe multiple mailboxes to the cmdlet without regard for whether any or all have archives.) There are no restrictions on which parameters you use for a search filter (aka, there are no parameter sets), but using some combinations won’t be of value. For example, providing an entry ID negates any value of also specifying a subject. RestoreToFolderId is the short folder ID where the item has been placed. WasRestoredToOriginalFolder will be True if the original folder was known and still exists, False is the original folder was known but no longer exists or if the original folder was not known. WasRestoredSuccessfully will be True if the item was actually moved to the folder listed in ReturnedToFilePath, or False if an error occurred. ReturnedToFilePath is the folder path where the item can now be found. One frustration of the MFA module for connecting to Exchange Online is its inability to use the refresh token it gets from Azure AD. As a result, you can use the session for 60 minutes before you are prompted again for credentials. This makes it very difficult to run any scripts or long-running commands without it stopping mid-run to get your username and password, just to have it happen again 60 minutes later. This limitation has been fixed starting with version 16.00.2015.000. If you load the module from the desktop shortcut, the updated version is installed automatically. (If you side-load the module, you’ll want to run the shortcut so it updates and be sure your code is loading the highest version. The other requirement is that you must use the UserPrincipalName parameter when running Connect-ExoPsSession . It is not a required parameter (like it is for Connect-AzureAD ), so you might be used to simply running the cmdlet and entering your UPN in the authentication form. The reason for the UPN requirement is because, if you provide it in the authentication form, the cmdlet has no reference for which user’s refresh token to present when the access token expires. It only knows which user authenticated in the first place if you provide the cmdlet with your username and let it pass it to the authentication form. The other benefit you get with this fix is that, unlike using PowerShell remoting with Basic authentication, the module is able to silently reconnect after the session has been broken. I successfully tested this by connecting one afternoon, changing networks and putting my laptop in sleep mode overnight, then running a cmdlet in the existing shell the next day. I briefly saw the modern authentication prompt, it went away, then created a new implicit remoting connection and executed the cmdlet, all without having to type a username or password. Even if you do not have MFA requirements, you may want to consider using the module to connect to Exchange Online for this added benefit.